The Moscow Airport Attack: Were Early Clues Ignored? 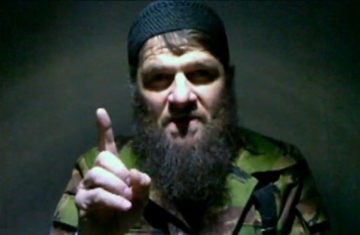 On Jan. 15, Russia's state news channel reported the death of Doku Umarov, the country's most wanted terrorist. The report didn't say how he died, nor did it seem to care that the only source of this information was a rumor spreading through a village in Chechnya. The news was just too good not to broadcast. But it turned out to be very wrong. In the past three days, Umarov has released two of his trademark videos, claiming to be the mastermind behind the suicide blast that killed 36 people in Moscow's largest airport last month. His propaganda war  and possibly his wider insurgency against the Russian state  looks to be more alive than ever. Compared to his previous videos  short, monotonous clips that follow almost all the bombings in the Russian heartland, even if he had no connection to them  Umarov's latest offerings suggest a much more quick-witted approach to information warfare. In the first, undated video, which was posted on the Islamist website Kavkazcenter.com on Feb. 5, he shifts away from his usual tack of defending the Muslims in Russia's North Caucasus region. Instead, Umarov tries to play on the fears of Russia's broader Muslim community, which in December became the target of a massive race riot in Moscow. "[Russians] have turned on the Muslims who have no choice but to live in Russia, to live in Moscow ... and have started attacking them in huge numbers," he says, from inside what looks like a concrete bunker. "Today we are forced to answer this lawlessness." Seated to Umarov's left is a young man he introduces as Seifullah  Arabic for "sword of God." Staring meekly at the ground, the man states his willingness to commit a suicide attack. "Let the infidels know that more of my brothers will follow after me to give their lives in the name of Allah," he mumbles. "These are my last words." Yevloyev, the son of a retired bus driver and a grade-school teacher, reportedly left home in September and disappeared after failing to find a job. If police confirm that he was indeed the one who attacked the airport, it would testify to a tragic failure in the Kremlin's campaign to create new jobs to lure men like Yevloyev away from the Islamist underground. So far, these efforts have shown few results, a point that Umarov would have been keen to emphasize in choosing a suicide bomber. The man seated to Umarov's right in the video also seems to play a key propaganda role. Umarov identifies him as Amir Khamzat, the leader of one of Russia's oldest insurgent battalions, which was responsible for the 2002 theater siege still thought to be the worst terrorist attack Moscow has ever seen. Dozens of gunmen took 850 hostages that October, and nearly 170 people died when police stormed the building. The apparent fact that this battalion still answers to Umarov would bolster his status, undermining reports in the Russian media that his authority was crippled last year after two of his top Chechen lieutenants abandoned him. But Yulia Latynina, an expert on terrorism in the North Caucasus, says Umarov is trying to claw back the influence he lost after that August break in the ranks. "When the Chechens left, they took with them the main representative of al-Qaeda in the Caucasus," Latynina says. "This cut off [Umarov's] international ties." In the second video, which was released on Kavkazcenter.com just before midnight on Feb. 7, Umarov seems to be trying to win back his links to the global jihad. Sitting alone in a dark room, he says he ordered the Jan. 24 airport bombing in response to Russian abuses against Muslims in the Caucasus, before launching into a 15-minute rant on the uprisings in Tunisia and Egypt  "One set of marionettes being replaced by another"  and raging against the U.S., Israel, Britain and Russia, calling them "satanic regimes" and "occupiers" of Muslim lands. But the lecture takes a comic turn when he recommends, seemingly in earnest, that the U.S. and Russia cede their global hegemony to China. "This is the babble of an isolated warlord trying to prove how much he knows about the world," says Latynina. It's unlikely to earn Umarov much support from global Islamist networks like al-Qaeda, but that doesn't make him any less dangerous. "He has confirmed what we suspected but perhaps wished to forget," says Alexander Cherkasov, a board member of Memorial, one of Russia's leading human-rights groups. "With the airport bombing, he has reminded us that we live in a country at war, where a single soldier  or even a battalion  can attack soft targets at any time." By trying to cast himself as a defender of Muslims across Russia, not just in the North Caucasus, Umarov is reaching out to new recruits and financiers from a community still outraged by the neo-Nazi riot that took place on Moscow's Manezh Square in December. "Manezh Square has given him a new ideology to try on, the ideology of defending Muslim honor in Russia," says Cherkasov. "That is a useful tool." And to fight against it, Russia's special forces and propaganda men may need something stronger than false rumors of Umarov's death.